We left a snow bound London to arrive in Accra at 10.30 at night with the temperature at a humid 32 degrees. The heat just hits you, right there, at the back of the throat, taking your breath away. Immigration procedure was long and tortuous in the non air-conditioned airport terminal – embarkation cards completed, signed & handed over, iris recognition image scanned, finger prints taken, yellow fever inoculation certificate checked. Our driver was waiting in arrivals and we sped away for our first night in Ghana at the Airside Hotel. We were a party of five – myself and my colleague Alistair Menzies from Divine Chocolate, Jenny Dixon and Rachael Gray from The Co-operative and Jenny Carlyle from Suma, the wholefood wholesaler worker’s co-operative in Elland, Yorkshire. Sunday morning we were up with the cockerels and breakfasted in the Zara restaurant. A splendid buffet catered for everyone’s tastes and offered a delicious choice from fresh pineapple & papaya to rice and spicy beef curry. 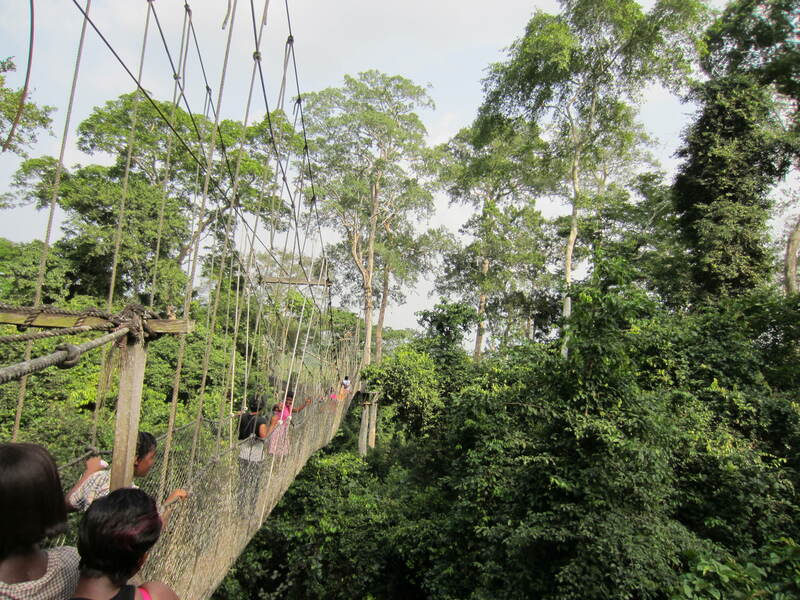 Today was going to be a leisurely day visiting tourist attractions and making our way to Kumasi, Ghana’s second city. We were collected by our drivers who were going to accompany us on the whole trip – Enoch, Joe and Abdulai. We set off westward to Elmina Castle. Built by the Portuguese traders in the late 1400’s, the castle was built to protect the gold trade. But following its capture by the Dutch in 1637, it came to serve the Dutch slave trade with Brazil and the Caribbean. The Castle housed luxury suites on the upper levels for the European governor, traders and soldiers. The slave dungeons below were cramped, dark and filthy cells housing up to 600 men and 400 women at a time. The governor could look down from his balcony on to the courtyard where the women slaves would be lined up and he could choose his companion for the night. 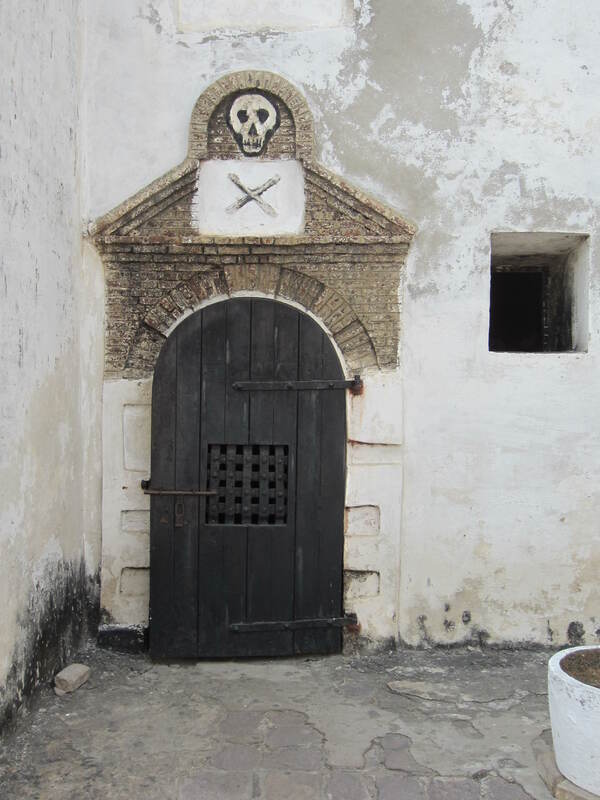 At the seaboard side of the castle was the infamous “Door of No Return” through which the slaves passed through one by one to board to waiting ships that would take them on a treacherous journey across the Atlantic. Over three centuries it is estimated that 60 million slaves were captured with only 20 million surviving capture, imprisonment and the journey to the New World. We all knew something about the slave trade but to see where the slaves were imprisoned in dark, dank, squalid conditions brought home the true horrors endured by Africans for three centuries. We continued 4 kilometres from the coast to the Hans Cottage Botel where we stopped for lunch. Holiday cottages and a restaurant situated in a lagoon which is home to crocodiles, turtles and many birds. 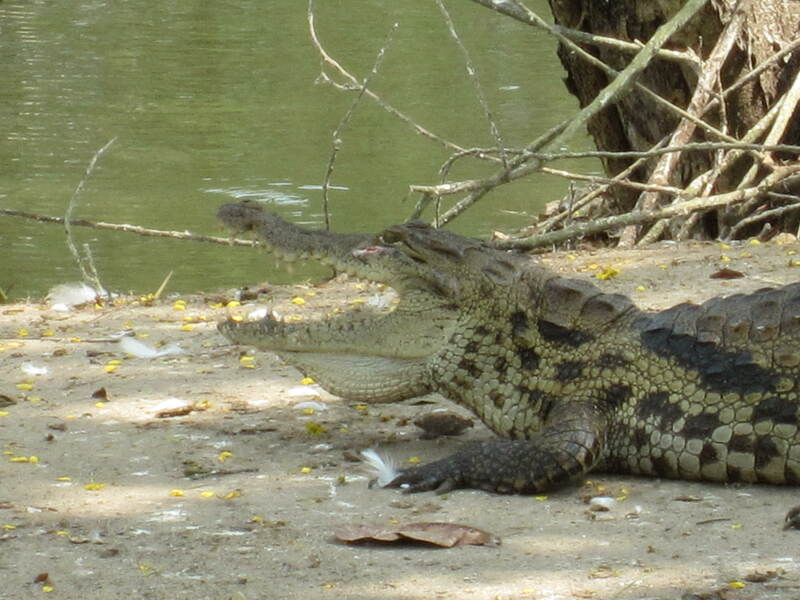 Although the crocodiles are said to be friendly, we weren’t going to risk getting too close and stuck to taking photos from behind the safety of the wall. We were however, very adventurous with our choice of food and all opted for the Ghanaian traditional fayre of beans, rice and fried plantain. And very tasty it was too. red in colour with plenty of pot holes. Either side of the road was forest vegetation – plantain, banana, papaya and palm trees and road side vendors selling their home-grown produce – water melons, pineapples, oranges, lemons, coconuts and freshly fried plantain chips. We passed villages with unstructured layouts bustling with activity and always with a cleared level area for the football pitch with goal posts either end. We were happy to at last to arrive at Kumasi and check in to the Rees Hotel, where we could revive our hot & dusty selves. We ate in the hotel that evening a mixture of European and Ghanaian dishes. Refreshed and well rested, we met up early morning for an unusual breakfast – spring onion omelette with cold baked beans and 4 triangles of barely toasted, sweet white bread. Surprisingly tasty. Collected by our trusty drivers we headed from the hotel to Kuapa Kokoo offices where we met up with Francis who was going to be our translator and Vincent who was in charge of taking photos & video recording. Kuapa Kokoo is the co-operative of cocoa farmers who grow all the cocoa which goes in to making Divine Chocolate – and own 45% of the company. The ancient capital of the Ashanti kingdom, Kumasi has a population of 1.5 million and judging by the gridlocked roads, the same number of cars. It took time and patience to drive out of the city, the roads noisy with horns tooting and nose to tail with yellow painted taxis, motor bikes, seriously large 4 by 4’s, tro tros – the Ghanaian equivalent of the mini bus, with passengers sardined inside and outside packed high with all their belongings – goats included tied to the roofs. The city sprawls on forever with a ramshackle shanty town – dwellings fronted by trading posts selling everything from car engines, doors, coffins, beds, carpets to all manner of electrical appliances. And all along the carriage way are street sellers offering their wares to the hot & frustrated drivers – bags of cooled water, refreshing coconuts, snacks, pieces of water melon, handkerchiefs, sim cards, loaves of bread, all displayed beautifully in baskets and bowls carried securely and proudly on the head. Eventually the landscape changed to a more rural setting and we turned off the main road and arrived at Amankwatia village. In 2010 to celebrate 5 years of sourcing cocoa from Kuapa Kokoo for their own label Truly Irresistible range of chocolate, The Co-operative co-funded with Kuapa Kokoo the building of a new Junior High School. Jenny & Rachael from The Co-op were here to see how the school was doing and how it was benefitting the 13-19 year old students from Amankwatia and the surrounding villages. We were welcomed in to the village with singing and hand clapping by about 50 cocoa farmers who had given up their time to greet us. 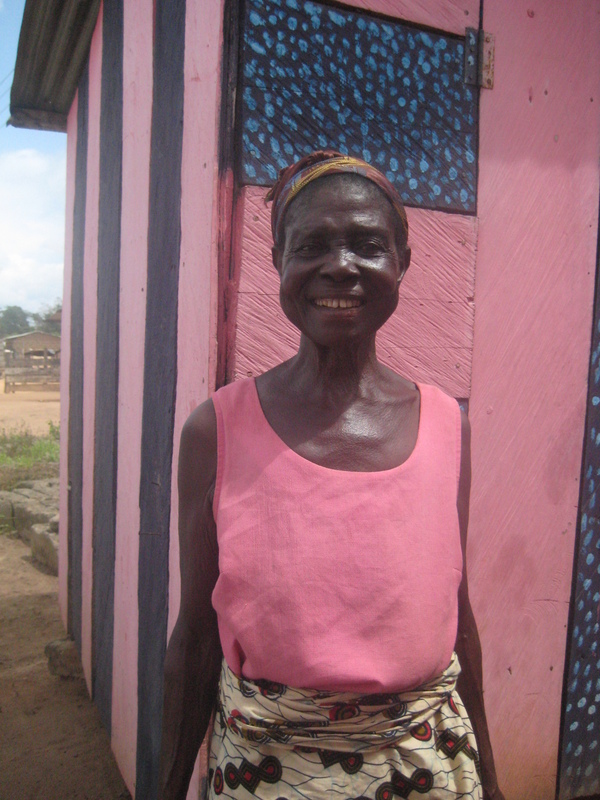 We were introduced to the Recorder Samuel Antwi, the society secretary, the village chief who was also a member of Kuapa, and Adwoa Asianaa he oldest cocoa farmer at 83 years- a feisty lady who looked half her age and who had harvested 20 bags of cocoa that season – and the youngest at 42 years. As well as the school, the benefits to the village for being members of Kuapa Kokoo and co-owning Divine Chocolate have been the installation of a corn mill, solar panels for electricity, and machetes for each farmer – a vital tool for the harvesting of cocoa. And an opportunity for the women to learn new skills to supplement their income – tie dying and soap making with the cocoa pod husks. 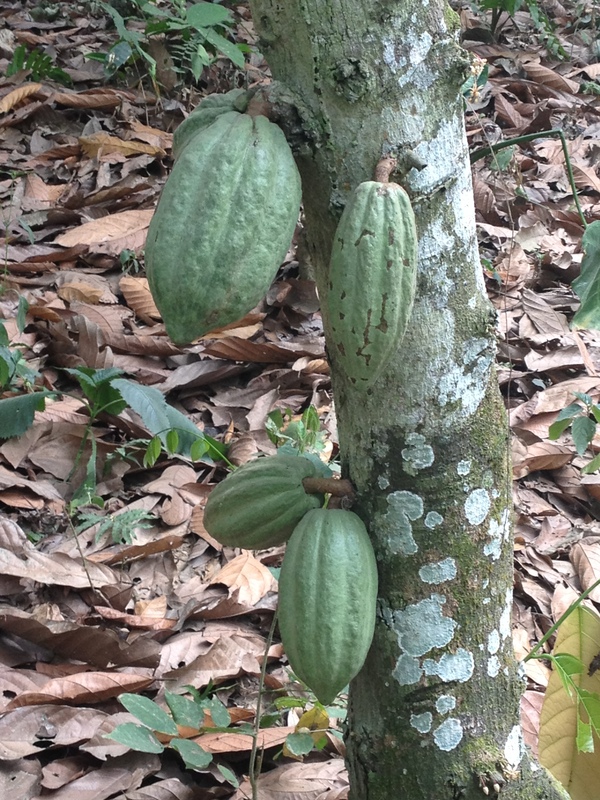 We took a short walk out of the village in to the forest where the cocoa trees grow amongst the orange and papaya trees. It’s near the end of the season and the weather has been unseasonably hot but there were still pods ripening. 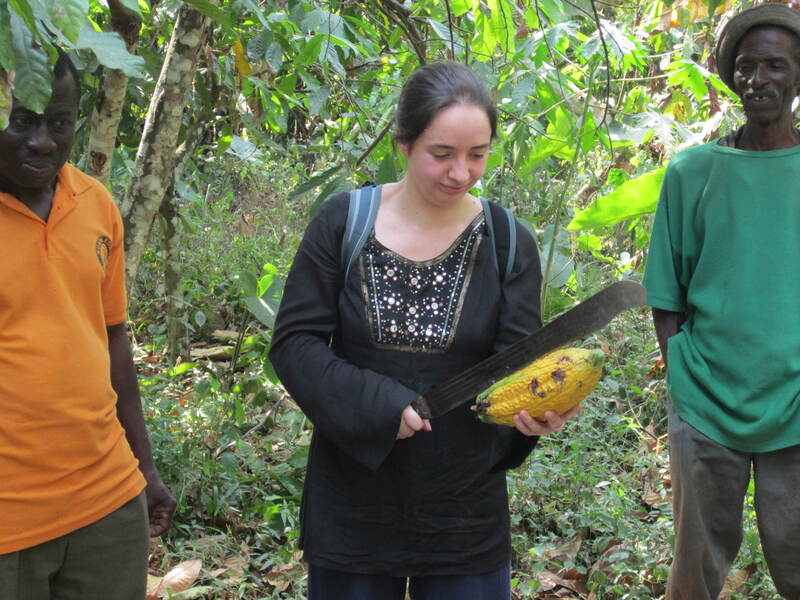 We were shown how to harvest a cocoa pod – with care and diligence so as not to damage the trunk, how to slice it open with the machete and remove the beans. We all got a taste of the sweet white flesh surrounding the bean. The farmers work as one team, harvesting, fermenting and drying the beans together going from one farm to the next in what is known in Twi as “ Nnoboa” – you help me and I’ll help you & let’s work together. Having read how it’s done, seen the films on how it’s done, and heard the farmers tell me how it’s done, it was wonderful to actually be part of the harvest and an honour to be presented with a freshly harvested, weighty cocoa pod. 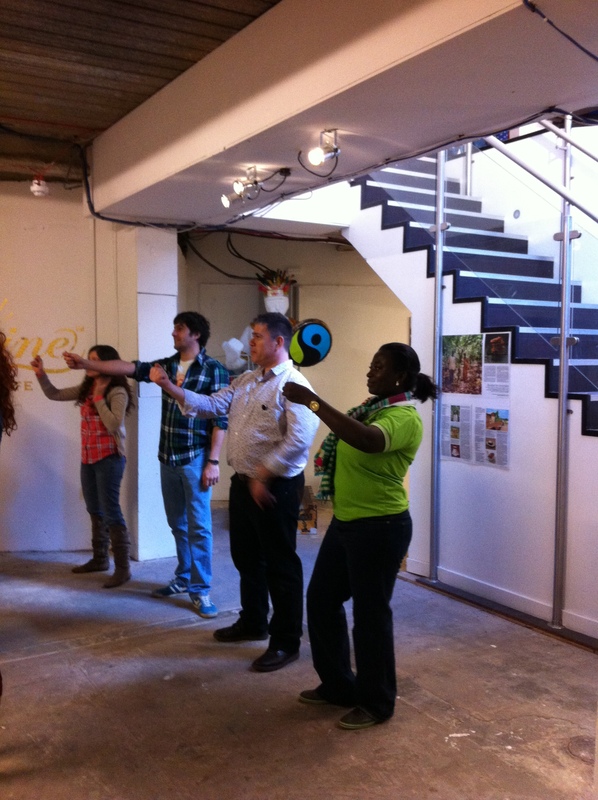 so what better way to break the ice than to ask them to do a bit of Azonto dancing for us! Two willing dancers soon got the class clapping and laughing. On a more serious note, one of the students, 19 years old and luckily still in education, said how much he would love a bicycle to make his 6 mile journey to and from the school a little easier. 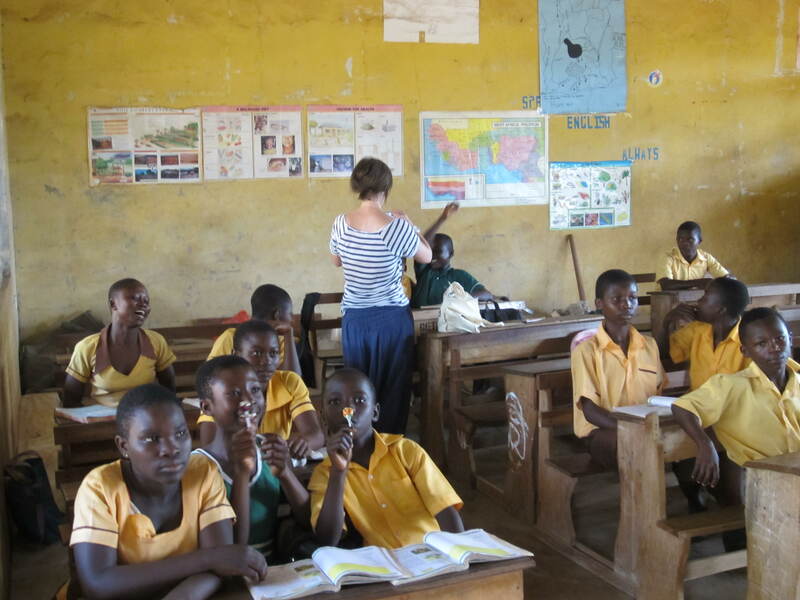 Many of the students come from neighbouring cocoa growing villages and the time it takes for the journey impacts on their learning time. Time to say our goodbyes and thank the villagers for their hospitality with gifts of Co-op T shirts, pens and pencils for the students and soaps for the ladies. On route back to Kumasi we stopped off at the regional depot where all the sacks of cocoa are delivered, weighed, recorded, graded and then loaded on to a truck for shipment to the port of Tema. Rachael from the Co-op, in her role as technical & quality manager was full of praise for the efficient and accurate traceability systems in place. A dinner hosted by Kuapa staff and members of the Farmers Union was a lovely end to a fabulous day. 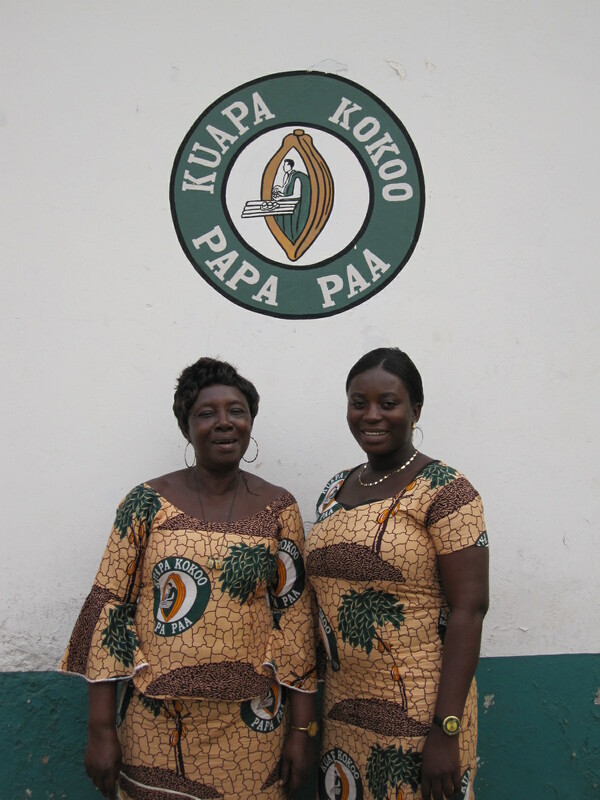 In the morning we went to the Kuapa Farmer’s Union offices where Esther presented the history and mission of Kuapa Kokoo to give us a first-hand understanding of the workings of the co-operative. We also had the pleasure of meeting members of the NEC – National Executive Committee, the elected members of the farmer’s union. It was a pleasure to meet up with old friends – Elias Mohammed who had come to the UK for Fairtrade Fortnight in 2012 and who I’d had the honour of accompanying around Scotland, and Fatima Ali who I had been with in Cardiff in 2011. We then headed off to New Koforidua, a village which serves as a centre to a community of 5,200 people. 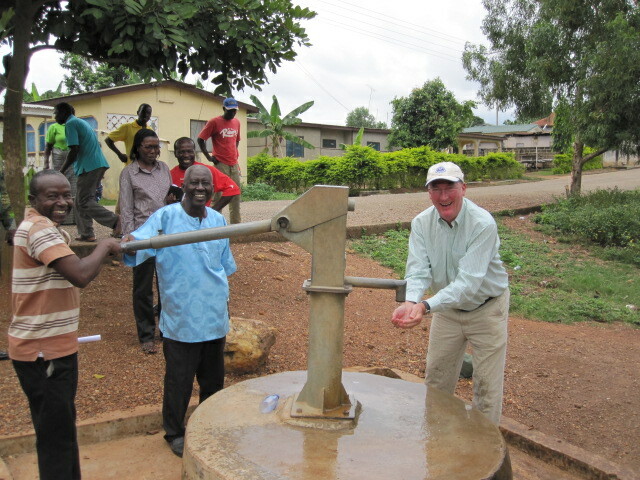 Here the school was funded by the Fairtrade premium and the community house was funded by The Co-operative. The community house serves as a meeting place, library and conference centre. We were welcomed by Walter Alifo, the headmaster and driving force behind the success of the village, and cocoa farmers from the villages and all the students. 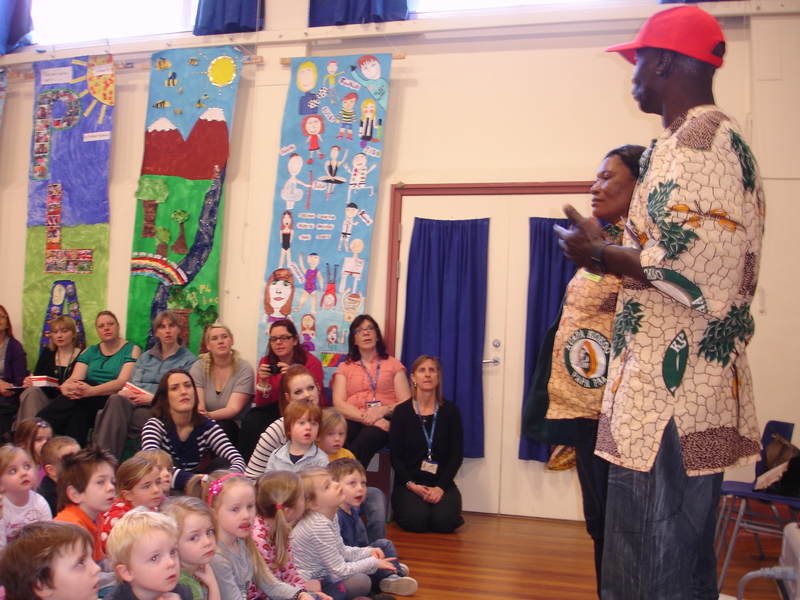 New Koforidua is a fine example of the benefits of Fairtrade as it is not only twinned with Garstang in Lancashire, the first UK Fairtrade town but is also calls itself the first Fairtrade village in Africa. Important visitors are given the honour of planting sapling cocoa trees outside the community centre – trees planted by Brad Hill from The Co-operative in 2010 and Sophi Tranchell the MD at Divine Chocolate in 2012 are growing tall & strong. Now the honour fell to Jenny from Suma to plant her sapling. May all the trees flourish and produce a good harvest. It was photo opportunity time with students putting on this year’s Comic Relief Red Noses and posing with giant Dubble bars – and throwing Divine chocolate coins up in the air to encourage everyone in the UK to “Do Something Funny for Money “ this Red Nose Day. We had also been given books to distribute which written & illustrated by the students from Surbiton High School. These were very well received and the students were full of admiration for the wonderful illustrations. We lunched under the shade of the trees and admired the village, the school and community centre. And then it was time to say our goodbyes and head to Kumasi airport and on to the winter cold & snow of the UK. 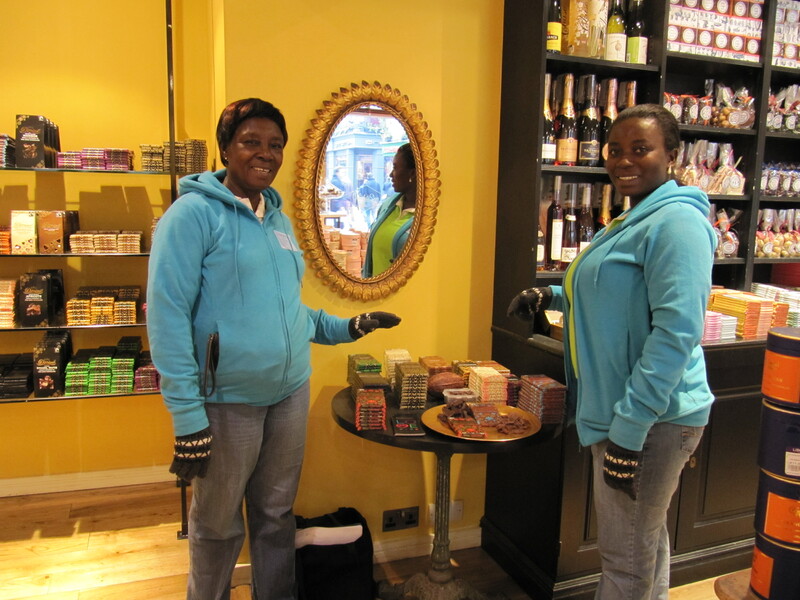 I have worked for Divine Chocolate for nearly six years and during that time have met a few of the cocoa farmers on their visits to the UK during Fairtrade Fortnight and have heard their stories, and learnt a great deal about cocoa production and the global cocoa & chocolate industry. 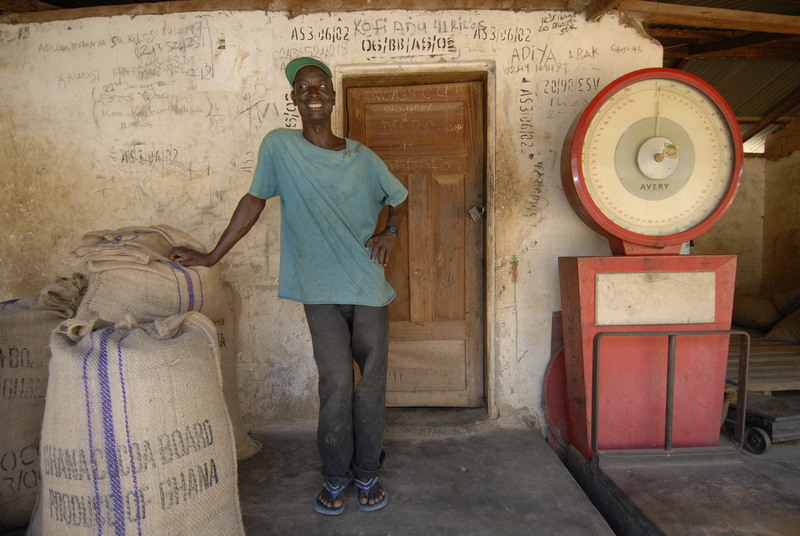 Actually visiting Ghana and seeing for myself how Fairtrade and farmer-ownership have improved the lives of cocoa farmers at first-hand has been an enlightening experience. Seeing the benefits of trading fairly and investing in the health and education of the next generation has made me more determined to make sure Divine is the chocolate bar of choice for all of us chocolate lovers. 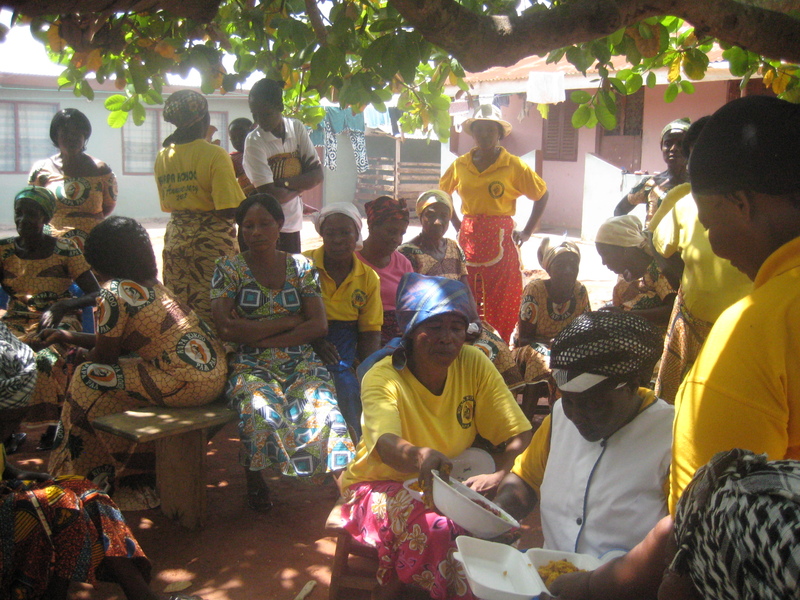 When you are a farmers’ co-operative with 65,000 members, many of whom are almost illiterate, living in village societies spread all over the Western and Central regions of Ghana often deep in the rainforest, how do you ensure all your members really understand how the organisation works, and the benefits and opportunities of belonging? This is Kuapa Kokoo’s really big communications challenge and one of its top priorities. Increasingly farmers have access to mobile phones which helps, but this isn’t a channel that fosters good community spirit and the idea of shared ownership. Up to now the most successful way of disseminating information throughout the organisation is through outreach teams that regularly visit all regions, and through encouraging societies to gather regularly to discuss local issues, and then cascading information up and down the organisation. One medium that most farmers can easily access is radio – and radio as a forum for open discussion is extremely popular in Ghana, as well as for general entertainment. The idea of Kuapa Kokoo’s own radio programme was mooted last year, and it was an idea that took root. Divine Chocolate offered funding support, and over the following months the communications team at Kuapa Kokoo developed ideas for a pilot series of programmes, and liaised with us at Divine for advice on how to ensure maximum appeal and value to the audience. An then in November this year they went live – with the first Kuapa Hour – or in Twi – Kuapa Mmere. For eight consecutive weeks the programme went out on Monday evening from 7.00 – 8.00 on Debeat FM – which covers 15 areas in the Western Region where Kuapa members are largely concentrated. 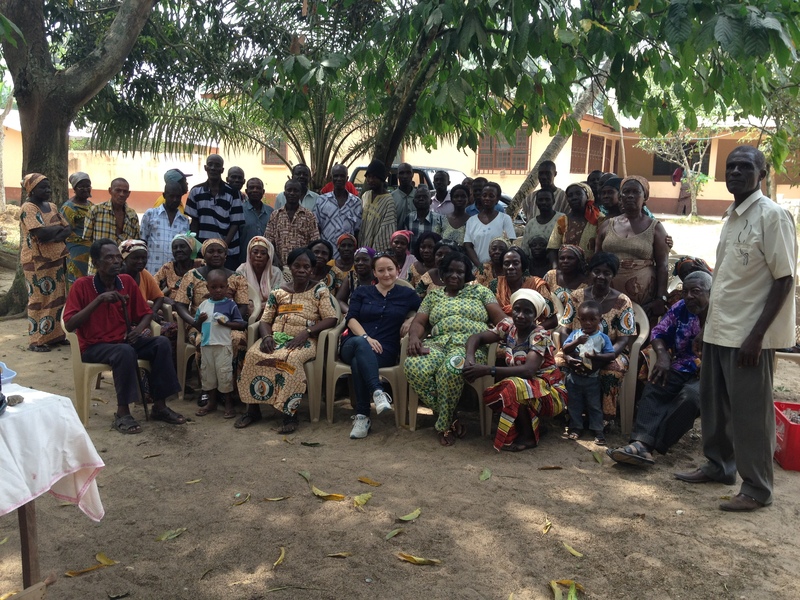 The aim was to ensure the membership was really fully informed about what the Kuapa organisation does for farmers, the benefits of being a member, and particularly about the aspects of Kuapa Kokoo that really sets it apart from any other cocoa buying companies in Ghana. In between the sections where Kuapa elected representitives and Kuapa staff were interviewed by the radio presenter on different aspects of the organisation, there were jingles, music, and singing to ensure the programme was pacey and entertaining. As hoped, most popular was the phone-in section – with farmers – both members and non-members – calling in to ask questions and give witness to their own experiences. 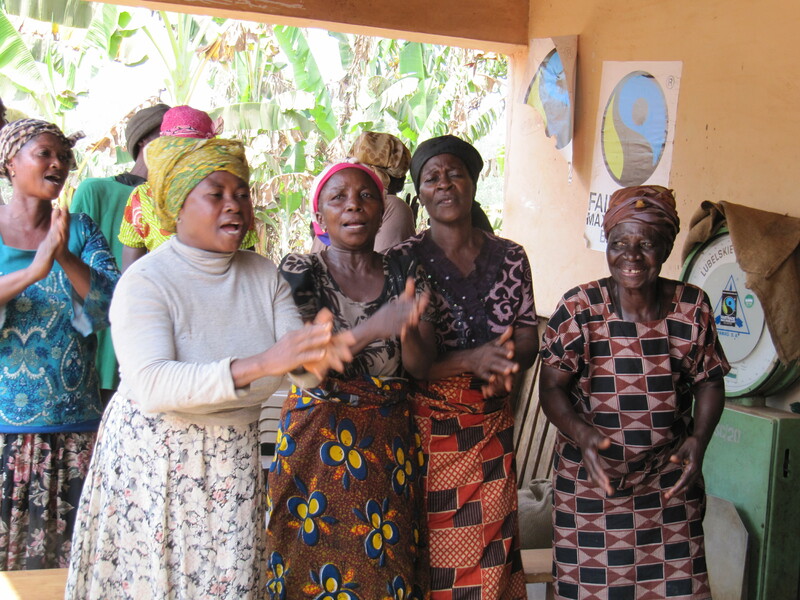 The programmes tackled issues such as the benefits of democracy and co-operation, and the role Fairtrade has and is playing in the success of the organisation, and how the members vote for how the Fairtrade Premium is used and invested. They talked about farming issues, good practice, and went into some detail about Kuapa’s own Child Labour Awareness Programme which has been particularly active in the Western Region. Monitoring the success and reach of the programme, the Kuapa team heard that groups would gather round individual radios, or whole villages would listen to it via a rigged up public address system. Notes were taken of how many farmers called in each time and of all the points raised and made. There were those like Augustine in Kroboline who rang just to say how proud hearing the programme made them feel to be a member, and others like Gifty from Sefwi-Boako and Elizabeth from Adabokrom who rang to say what they had heard had persuaded them to join. Some rang to tell their own personal experience of benefits they had received – Owura from Nyametease society reported that all the members in his region had received their bonuses, and Kwaku from Akrafu Society let listeners know that the mobile clinic that had come to them had saved the life of a fellow farmer suffering from a hernia. Two programmes attracted the most callers. The one which told the farmers more about Divine Chocolate the company in which Kuapa has a 45% stake was a big hit. 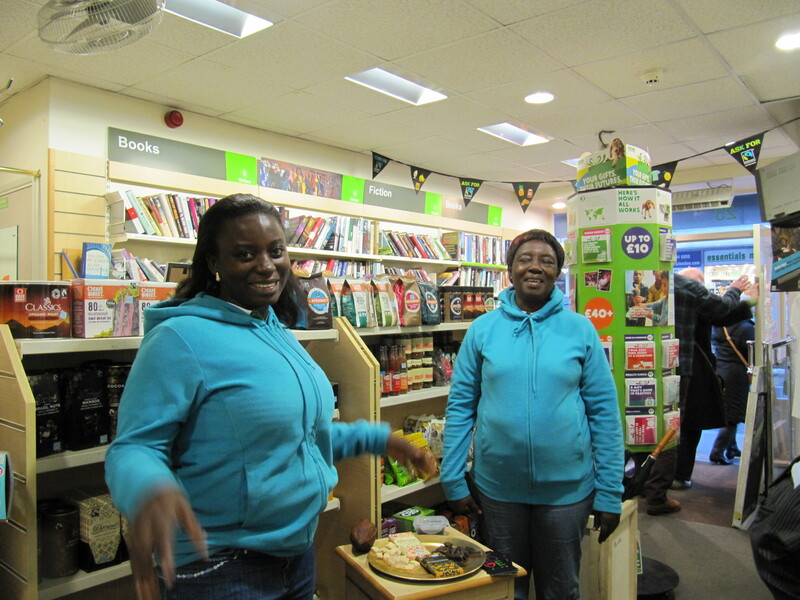 One caller suggested that Kuapa members’ children should learn more about chocolate production at school, and another was interested to know how to become a Kuapa ambassador visiting UK for Fairtrade Fortnight. The other programme which raised most discussion looked at the issue of child labour and made clear Kuapa’s policy on this. It was a very useful exercise as it aired key questions about what constitutes child labour, and whether children can help on farms outside school hours. 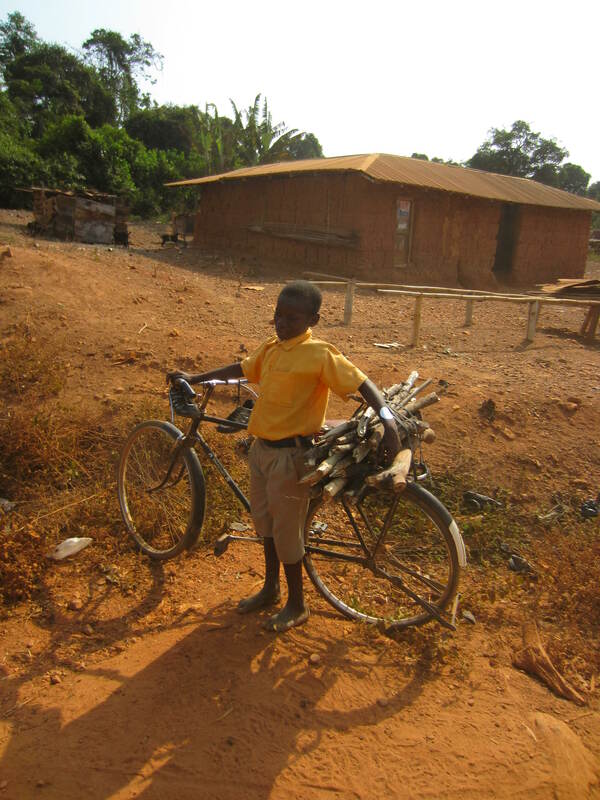 Kuapa was able to report on the success of the Child Labour Awareness Programme across the region, and how many more children were now in school, the benefits of education more fully understood, with additional assistance to families given where needed. Over the eight weeks the Kuapa Mmere show got 84 callers who actually got through – both members and non-members. The radio station reported many more trying to get through after the programme was over – it was pretty clear that the 15-20 minute call-in slot wasn’t enough! It’s proved a really effective forum for farmers to talk about both farming issues and practice, and the very many different benefits of belonging to the co-operative. Farmers wanted to talk about constitutional issues as much as bonuses and training. It is a great way to share information, and for farmers literally to have a voice, and to spread the message wider. As well as generating a feeling of pride amongst the members, its success has been a real affirmation of Kuapa’s continuing innovative approach to ensuring its members really see the value of belonging and participating. A new series of programmes reaching more Kuapa members is in the pipeline. 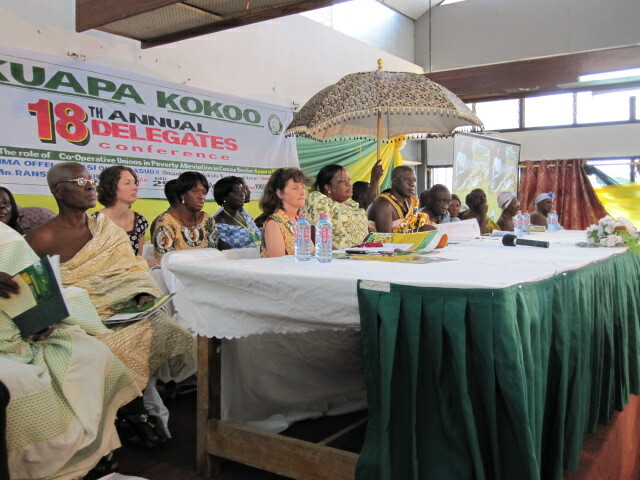 I’ve just been to Ghana for some meetings at Kuapa Kokoo – we’ve been working together on communications strategy. I haven’t been for a several months, so it is always very good to catch up with everyone. It was also great to go out to Bipoa and Bayerebon3 again and spend whole days in the villages talking with farmers and hearing how things are going, and reporting back from Divine Chocolate. “I like the way women are encouraged in Kuapa Kokoo,” she adds. At the moment Elizabeth only has one room in someone else’s house. Her dream is to make enough money to have her own house with a kitchen and bedrooms. “The women’s group will help me make it happen,” she says. 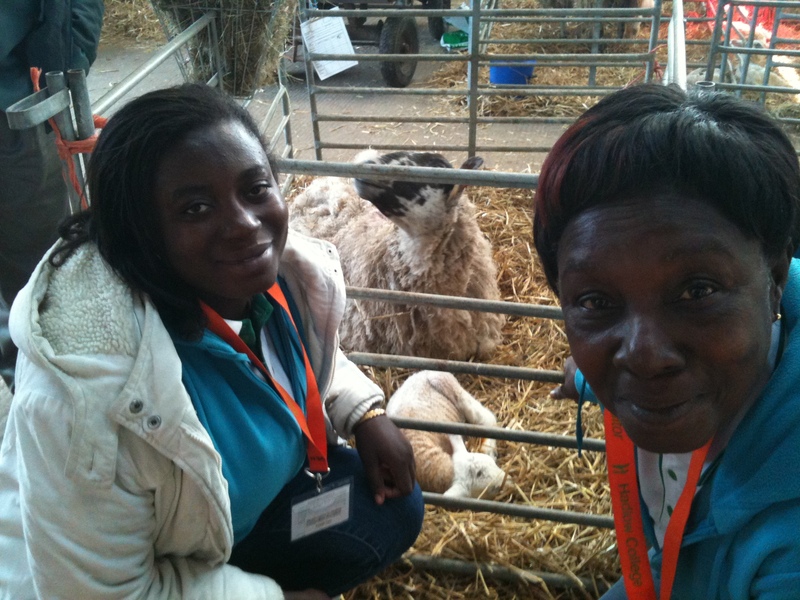 I talked to Georgina Oppong in Bayerebon3. She joined Kuapa Kokoo three years ago, and said she’d joined first and foremost because “everything is fair”. Then she talked about how proud she is to belong to the local Kuapa women’s group. Together they have requested a loan from the credit union, to give them seed money for setting up their income-generating businesses. 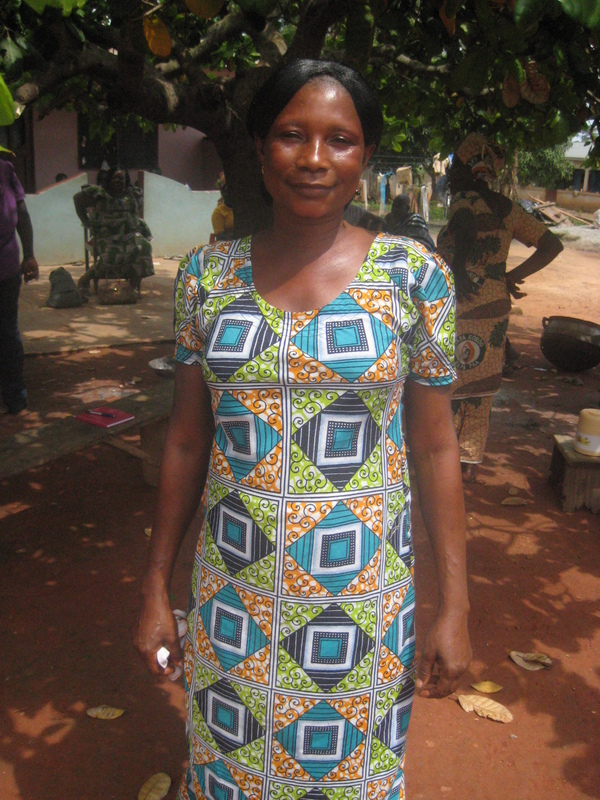 Georgina sells fish at the local market to augment her income from cocoa. 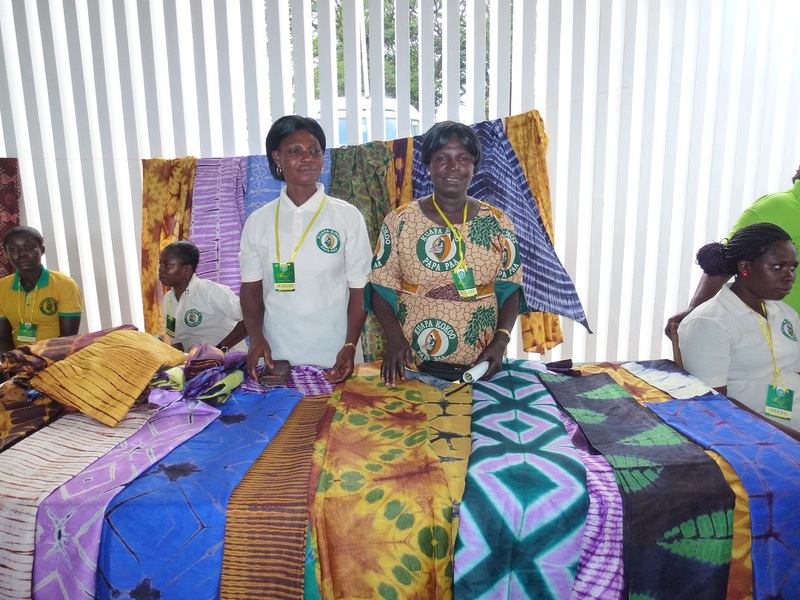 Women make up about a third of the membership of Kuapa Kokoo – and the development of the groups and the benefits they bring to women is a testament to the really proactive approach Kuapa has taken to its gender equality programme. The women are not just learning new income-generating skills alongside cocoa farming – but also really honing them. 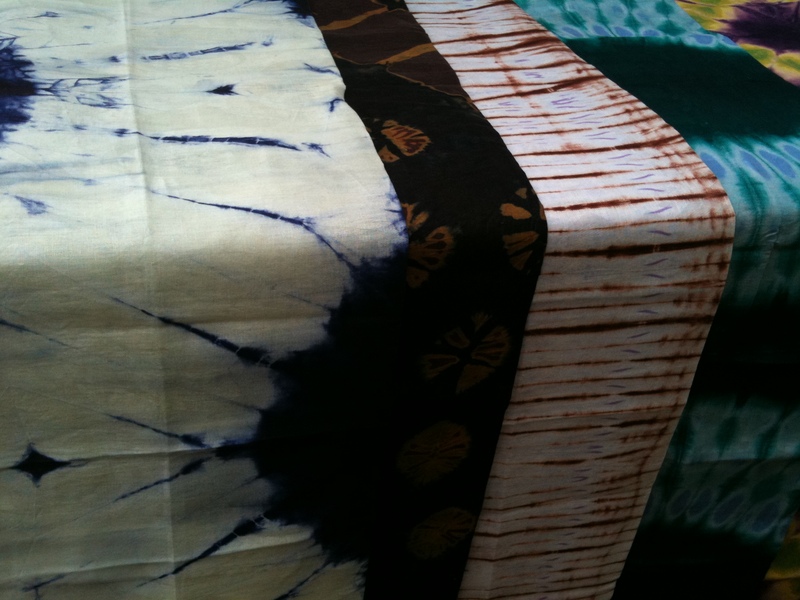 The tie-dye and batik fabrics I saw this time were considerably more sophisticated than those I saw a year ago. It seems to me that the women’s groups are creating a growing potential to bring in additional income to families and also to the organisation. It’s also clear to see that participation in the women’s groups builds women’s confidence, and they are increasingly putting themselves forward for elected positions in the cooperative – and taking on leading roles. Bayerebon No. 3 society, where I am recorder sees a lot of visitors from all over the world every year! People in my village always asked me one question I was never able to answer “da ben n’abrofo be ba abe fa wo ako won kuromu?” (when will the whites invite you to their country)? I had heard many tales of how beautiful “Abrokyire”(abroad) is and I always imagined myself there. My dreams came true early this year when I was selected to participate in the Fairtrade fortnight! I was so excited. My wives were elated when I informed them about the trip. I was in high spirits until I was refused a visa! I thought that was the end but thanks to Divine Chocolate, I was eventually issued a visa after an appeal. This problem cut short my stay by two days! The flight was good and the food was even better. I thought the Airport in Ghana was big and beautiful until we reached Heathrow. I couldn’t believe my eyes! It is so big, beautiful and busy! David of Divine Chocolate whisked me immediately to my hotel after going through immigration process. My days in the UK were very interesting. I met many people: Fairtrade officials, other producers like me, school children etc. We had a very busy schedule travelling from place to place in England and in Scotland to attend events and give speeches. I really enjoyed the encounter with school children. The enthusiasm of the supporters of Fairtrade and their love of Divine Chocolate encouraged me to always produce beans that are Pa pa paa (best of the best!). Upon my return to Ghana, everyone calls me “Burger” (a term used to describe people who have just returned from abroad). I feel proud when people call me that. I admit I would have liked more time to go shopping and more sight-seeing, but I think my trip was very successful. The high point of my visit was people smiling and saying thank you after my presentation. In February I was fortunate enough to have the chance to visit Ghana, representing the UK parliament at a Westminster Foundation for Democracy conference. I took the opportunity to go out a few days earlier and on one of my free days I went to see the work of the Kuapo Kokoo cocoa growers co-operative, which supplies cocoa to Divine Chocolate, the company it owns 45% of, in the UK. 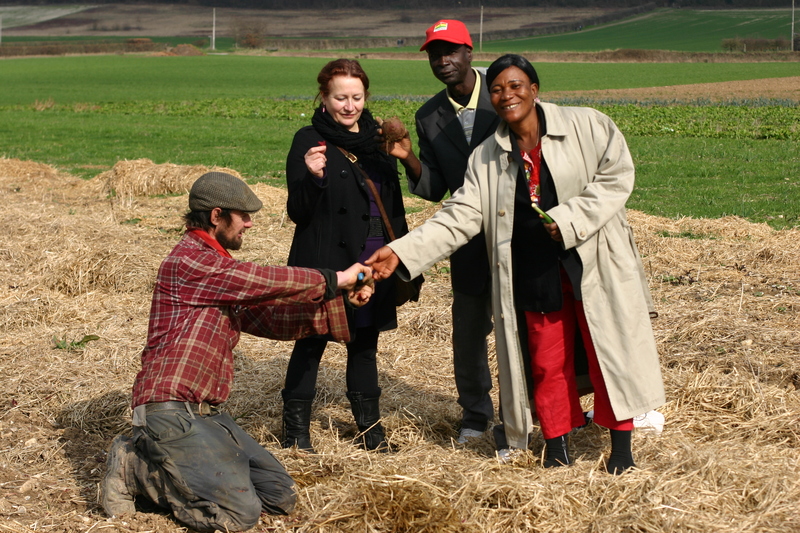 The co-operative structure, with villages grouped into collectives, and those collectives organised under an umbrella body at a regional level, means that distribution, marketing and other commercial arrangements can be done on a larger scale, ensuring the viability of the farms and continued growth. But the decisions that matter are still taken at a very local level and there is a real sense of collective purpose. 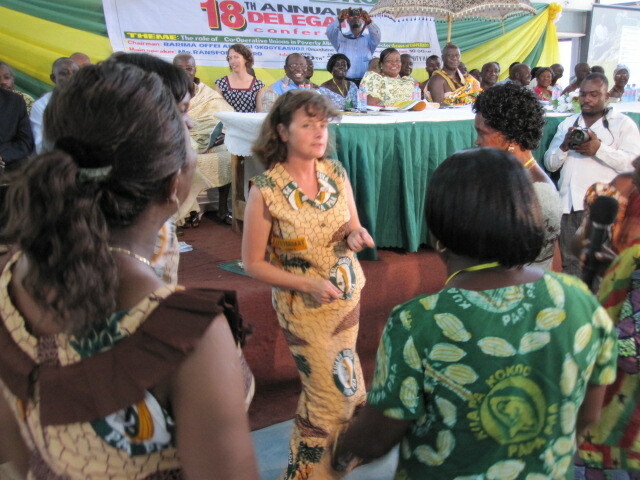 The welcome from the villagers was very warm, with the whole community gathered to meet me, and women in traditional dress bearing the Kuapo Kokoo logo and their slogan ‘Papa Paa’ –which means “the best of the best” – singing and dancing. We started with a question and answer session, sitting out in the sun, with villagers telling me how the collective was organised, what facilities had been provided – including the village school – and what more they needed – machinery, and a health centre closer to the village were top of their wishlist. 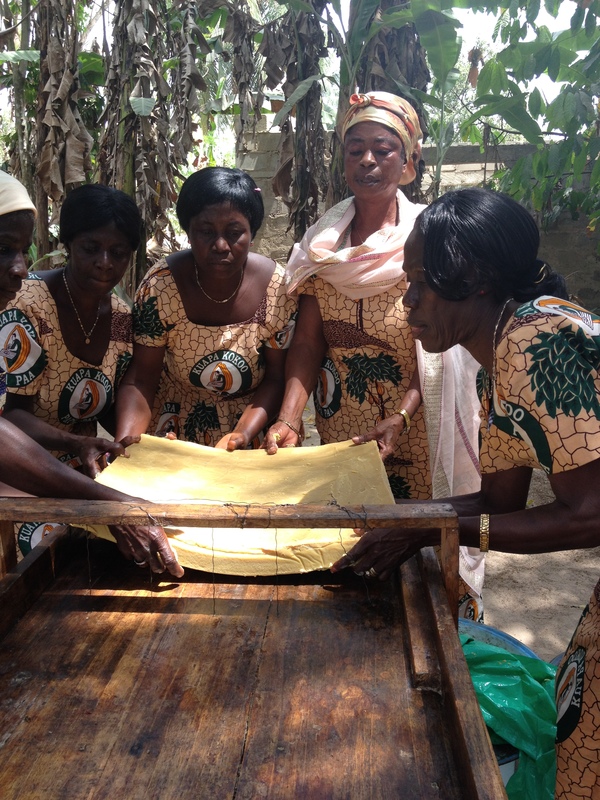 Then the women gave a demonstration of their new business sideline, making soap from palm oil, a simple but strenuous process, which, again, would be made easier if/when they can afford to invest in machinery to grind the kernels down. 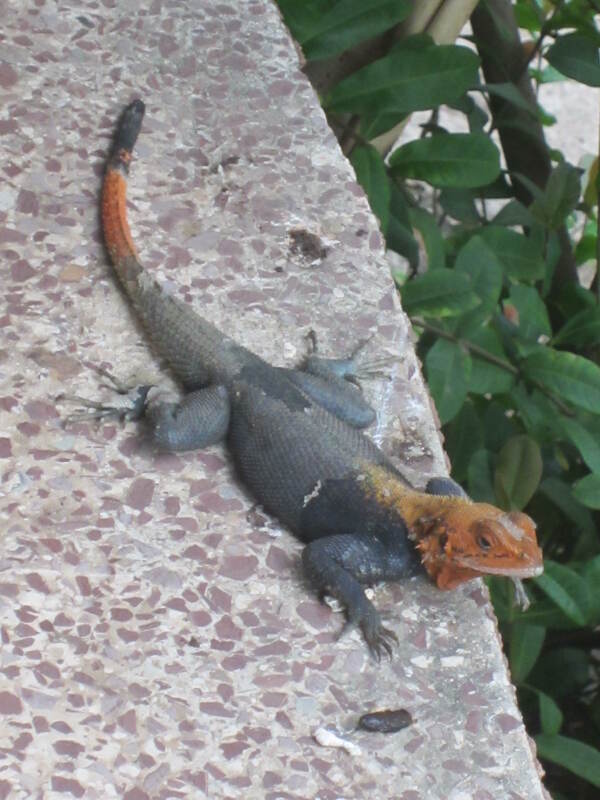 After this I went to look round the cocoa farms. It’s amazing how someone, somewhere, worked out that pods growing on trees, with their bitter, inedible contents, could through a process of fermentation and grinding eventually be made into the chocolate we consume in great quantities. I was shown the inside of a pod, and tried the sweet white pulp. 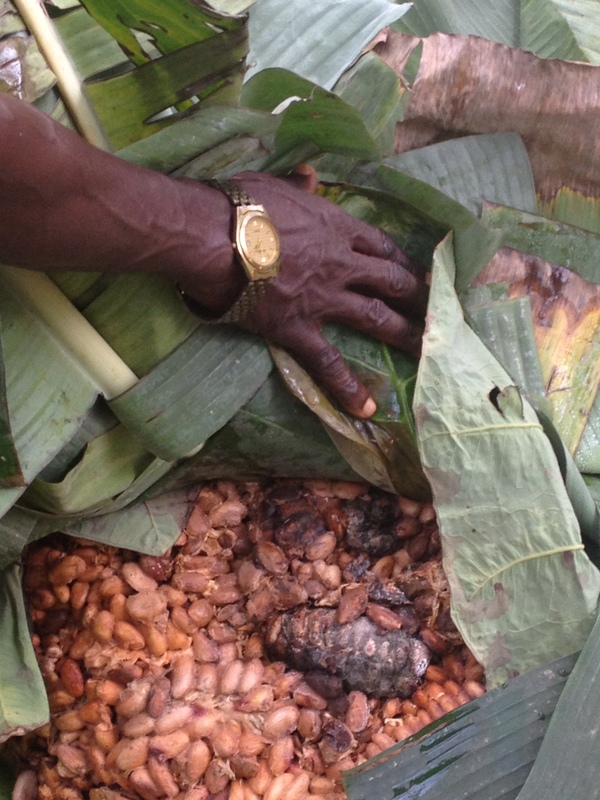 The cocoa beans at this stage are terribly bitter, but I was shown how they are fermented under a pile of palm leaves for some weeks. They look, to be frank, rather disgusting at this stage of the process…. but they are then ground up, and eventually, further down the line, turned into the Divine chocolate we know and love. The thing that impressed me most about the visit, apart from the warmth and hospitality shown by the farmers, was the fact that the structure manages to retain the best aspects of local, small-scale farming, where decisions are taken in the community, the benefits are felt in the community and everyone has a stake, with the advantages of organising on a larger scale, such as being able to export and reach new markets. It’s an admirable model that could be emulated elsewhere, including in the UK.